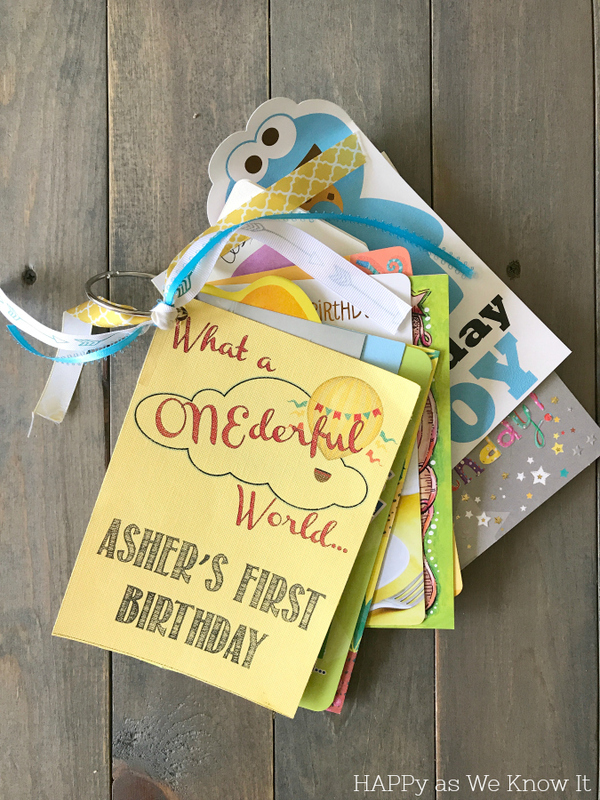 I am always grateful each year when my birthday comes around for the sweet and thoughtful cards my family and friends spend time picking out and filled with crafted messages of love and celebration. I may even hang several of them on our refrigerator for awhile afterwards to brighten my day as I pass by. But then I often wonder, what should I do with them after that? Do I throw them up in our attic in a box to store to be looked at once every couple years when I am in the mood to either to a) reminisce or b) for a good purge session? Or do I just go ahead and bite the bullet and recycle them immediately after I have read them as I know that is most likely their impending doom when I get into one of my minimizing clutter frenzies down the road. 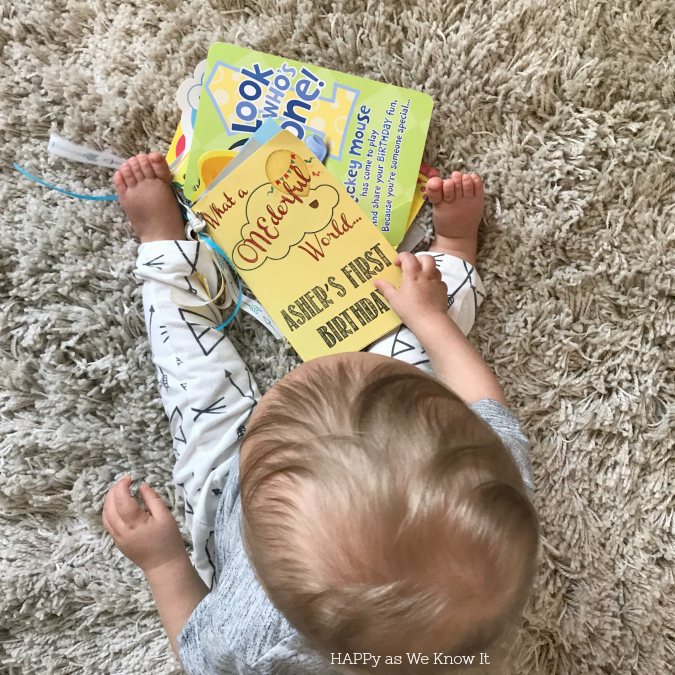 When little man's first birthday rolled around just a few short weeks back, I was left with the same dilemma. That being said, the sentimental mommy in me felt like I just couldn't let go of these cards quite yet. They are a reminder of all those who celebrated this momentous occasion with us. So once I had made up my mind to save them, the real question came in to play - what to do with them? Instead of throwing them up in a box in the attic, I decided to repurpose them. Little man loves books and textures these days, both of which I could accomplish with our birthday cards. Not to mention the book content was nothing short of loving and personalized to the babe! Putting the book together was simple. I grabbed a large binder ring we had on hand downstairs and some left over ribbon from his party banners. I then created a cover page by modifying his party invitation a bit. I had DIYed his invites which made this simple, but you could really create a cover page any way you'd like. Finally, I hole punched the corner of each card and placed them on the ring. 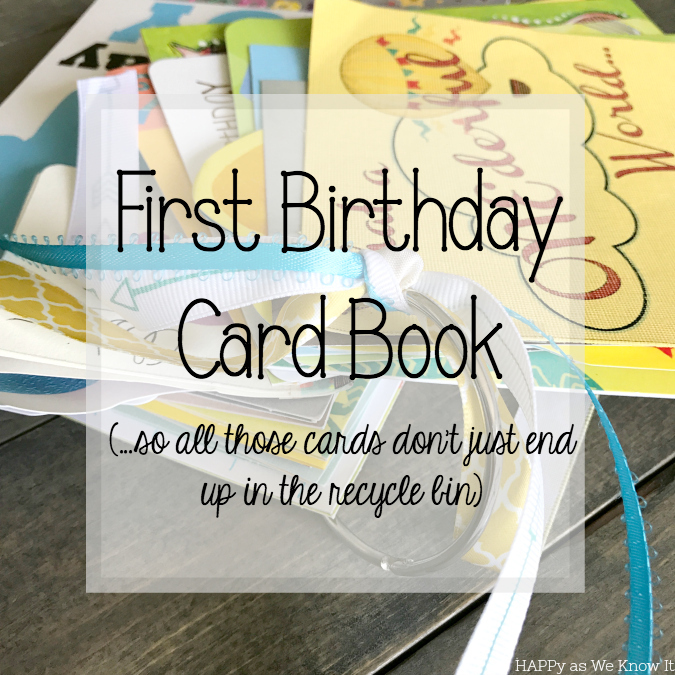 Within minutes we had a new book to add to our collection and an actual use for all of those birthday cards again. Oh, and in case you were wondering, mister man is loving his new book.